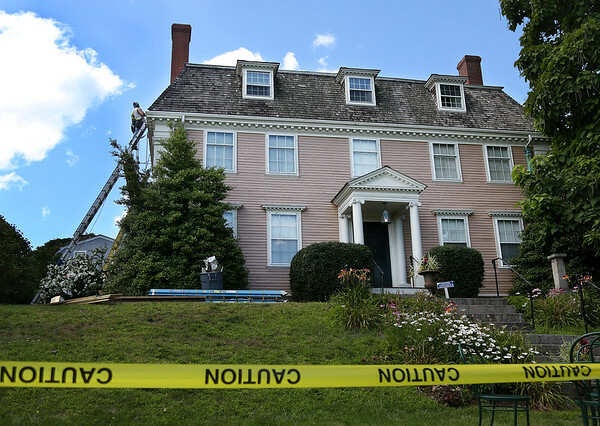 A worker with the Melrose-based Olde Mohawk historic preservation company works Thursday on the roof of the Sargent House Museum in Gloucester. Cedar shingles had been falling off the roof of the historic house for the past three or four years, so the museum applied for a Community Preservation Act grant in 2017 and was awarded $61,500 for renovations. The winning bidder, Olde Mohaw, is replacing the cedar shingles visible from the street and the asphalt shingles at the top of the building, repairing cedar gutters and lining them with copper, and replacing rotted trim wood around the dormer windows.